Osteochondritis dissecans (OCD) is a problem that causes pain and stiffness of the ankle joint. It can occur in all age groups. Most cases of OCD usually follow a twisting injury to the ankle and are actually fractures of the joint surface. The talus is one of the large bones in the back part of the foot that helps form the ankle joint. The area where OCD occurs is located at the top of the talus. Depending on how the ankle is injured, the problem can occur on the side of the talus closest to the other foot or on the outside part. The top of the talus is part of the joint and is covered with articular cartilage, the white, slippery material that covers all joint surfaces. On the talus, this covering is about one-eighth of an inch thick. This material allows the bones of the joint to slide against each other without much friction. 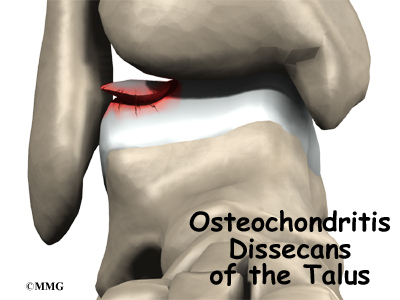 Right below the articular cartilage is the bone of the talus. The cause of most cases of OCD are thought to be actual chip-type fractures. These fractures occur with severe ankle sprains. Which side of the talus the chip is on depends on how the ankle was twisted during the initial injury. 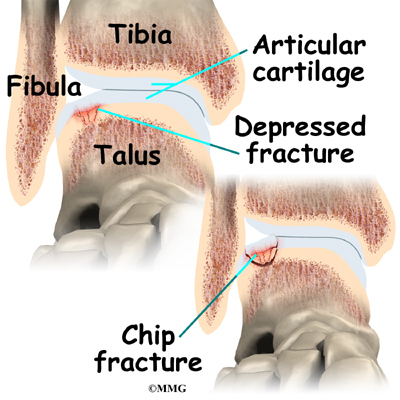 The chip fracture can vary in size and severity. If the bone underneath the cartilage is crushed or cracked and the articular cartilage is intact, the fragment is less likely to move. If the articular cartilage is broken as well, the bone fragment may move out of position, or displace, making healing less likely and later problems more likely. Because the bone chip is separated from the rest of the talus, the blood vessels traveling to the fragment through the bone of the talus are torn, and the blood supply of the bone fragment is lost. If the fragment displaces, these blood vessels cannot grow back. The fragment loses its blood supply and actually dies. This makes healing less likely. There is some evidence that the twisting injury may not cause a chip fracture initially. However, it may injure the bone's blood supply, leading to an area of the bone actually dying. This may explain some cases of OCD that appear without a well-defined history of a recent serious twisting injury. What does OCD feel like? Initially, OCD behaves like any other ankle sprain injury. You will feel swelling and pain and have difficulty placing weight on the ankle. No special symptoms suggest a chip fracture has occurred inside the joint. X-rays are the best way to determine whether a chip fracture has occurred. Later, continued problems with the fragment may cause swelling and a generalized ache in the ankle. You may also feel a catching sensation with the ankle in certain positions. This is because the chip can get caught in the ankle joint as it moves, causing pain and the sensation of catching. How will the doctor know it's OCD? The diagnosis of OCD may be suggested by the history and physical examination. X-rays of the ankle will usually show a problem on the top of the talus (sometimes called the talar dome). Special tests such as a computerized tomography (CT) or a magnetic resonance imaging (MRI) scan may be necessary to determine the full extent of the area involved. Treatment for OCD depends on when the problem is discovered. If the problem is discovered immediately after a twisting injury to the ankle, immobilization in a cast for six weeks may be suggested to see if the bone injury heals. You may need to keep weight off the foot and use crutches during this period of immobilization. If the problem is not recognized early, the bone fragment may not heal and may continue to cause problems. Surgery may be required to try to reduce your symptoms at this point. Surgery usually involves removing the loose fragment of cartilage and bone from the ankle joint and drilling small holes in the injured bone. When the fragment is removed, a defect shaped like a small crater is left in the talar dome. It is this area where the drill holes are made. The drill holes allow new blood vessels to grow into the defect and help to form scar tissue to fill the area. Eventually this new scar tissue smoothes out the defect and allows the ankle to move more easily. In some cases the surgery may be done using an arthroscope. An arthroscope is a special miniature TV camera that is inserted into the joint through a very small incision. Special instruments are inserted into the ankle through other small incisions. By watching on the TV screen, the surgeon removes the fragment and drills the defect. The ankle is a small joint, so it is sometimes difficult to get the arthroscope into certain areas. 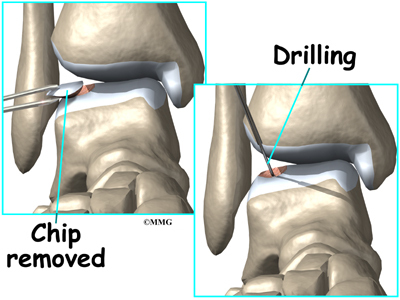 If the defect is in an area of the ankle difficult to reach with the arthroscope, an open incision may be required. This incision is usually made in the front of the ankle to allow the surgeon to see into the joint. Special instruments are used to remove the fragment and drill the injured area. If your surgeon recommends nonsurgical care with a cast or boot, you will probably use crutches for at least six weeks. During follow-up office visits, X-rays are taken so that the surgeon can follow the healing of the fragment and determine whether surgery will be necessary. Patients normally require crutches to keep from putting weight on the ankle for four to six weeks. Surgeons may have their patients start doing motion exercises very soon after surgery. Patients wear a splint that can easily be removed to do the exercises throughout the day. You will probably wear a bandage or dressing for a week following the procedure. The stitches are generally removed in 10 to 14 days. However, if your surgeon used sutures that dissolve, you won't need to have the stitches taken out. Your surgeon may have you take part in formal physical therapy after surgery. The first few physical therapy treatments are designed to help control the pain and swelling from the surgery. Physical therapists will also work with you to make sure you are only putting a safe amount of weight on the affected leg. The physical therapist will choose exercises to help improve ankle motion and to get the muscles toned and active again. At first, emphasis is placed on exercising the ankle in positions and movements that don't strain the healing part of the cartilage. As the program evolves, more challenging exercises are chosen to safely advance the ankles' strength and function. Some of the exercises you'll do are designed to get your leg and ankle working in ways that are similar to the activities you do every day, such as rising on your toes, walking, and going up and down stairs. The physical therapist's goal is to help you keep your pain under control, ensure safe weight bearing, and improve your strength and range of motion. When you are well underway, regular visits to the therapist's office will end. Your therapist will continue to be a resource, but you will be in charge of doing your exercises as part of an ongoing home program.